Who doesn't like winning free stuff? Sweepstakes have been a marketing staple for ages. They're super easy to host with SimpleTexting. 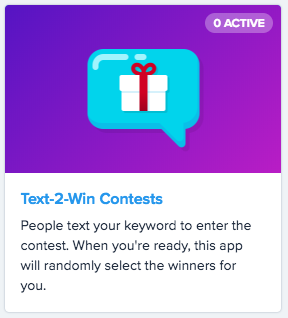 To enter, all someone has to do is text in your unique keyword to your number. We'll randomly select a winner for you. Watch this two-minute video and you'll be ready to set up your first text-to-win contest. 1. Click Apps on the left-hand menu of your dashboard. 3. Create a keyword if you haven't already. If you have, skip this step. Your keyword is the word of phrase people will text in to your number to enter your contest. 5. Give your contest a name. This is just for your reference. 6. Select the keyword you want to use. If you created a new keyword, it will automatically be selected. 7. Write your auto-confirmation message. Entrants will automatically receive this message when they text in your keyword. 8. Select how many winners your contest will have. 9. Check the age requirement box if you'd like to sent a minimum age for entrants. Be sure to comply with all local laws regarding sweepstakes. 10. Click Save. Review your contest information one more time then click Confirm. 11. When you're ready to pick a winner(s), click Select. Our system will randomly select the winners for you. 12. Click Notify winners to send a message to the lucky winners! 13. Done! You just hosted your first text-to-win contest!